Use our Slim Blade when a narrow cut is required. For all materials including glass, non-ferrous metals such as 12 - guage silver, copper, brass, aluminum, and more. It also cuts stone and marble up to 1/4" (6 mm) thick. The Taurus 3 Ring Saw Separating Blade opens up so that you can make an inside cut in the middle of a piece of glass up to 11" in size. All you need to do is drill a hole anywhere on the piece of glass, open up your Separating Ring Blade while it is still in the saw, put it through the hole, rejoin the blade and cut. Great for making small intricate shapes. fused glass, pattern bars and tile like much bigger saws. Exclusively for the Taurus 3 saw only. For dense materials. Because of its “tear drop” shape, the Mega Blade is our strongest blade ever. To date, no one has been able to break one. This blade is used differently than our Omni-directional blades. It is cuts mainly on the front and back, so to create a curve you will guide the material around the blade.The Mega blade is so rigid that it has the ability to damage the saw itself if used improperly by pushing too hard. So keep in mind the “golden rule” to let the saw do the cutting and do not force the material. 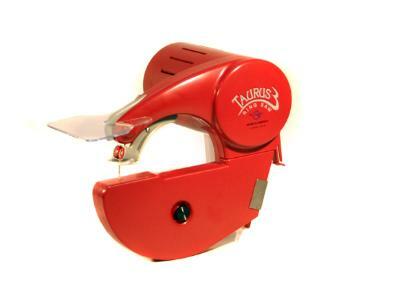 using Taurus 2.2 and Taurus 3 easier. The Super Slicer from Gemini securely holds pattern bars, cane, rods, and other small objects so they can be cut in perfectly parallel, thin slices. Cut slices as thin as 1/8th of an inch, and get up to three times the amount of material you can get out of a fused glass pattern bar. 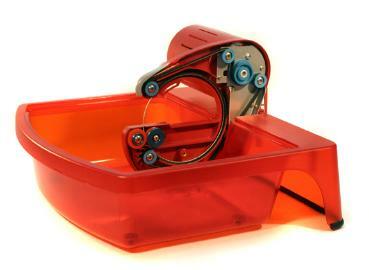 Works with most bandsaws and ring saws, trim saws and jig saws. It will cut through dichroic glass, rippled glass, fused glass, stone, tile and plastic. Using detached hand saw allows you to cut in all different angles. 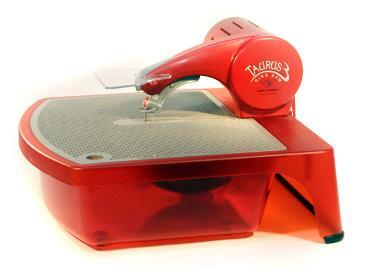 The Taurus 3 Ring saw was designed to make cutting glass easier. 110 volt 60 hz. 1 Standard Diamond coated, omni directional blade (installed), Integrated spot light, Removable face shield, 1 Stabilizer Foot, 1 Instructional DVD and instruction manual. 220/240 volt 50 Hz Taurus 3 With external transformer. Takes approx. 2-3 weeks. Cost is $469.00+ s/h. European plug. A few pictures to illustrate the inner workings of this great saw. 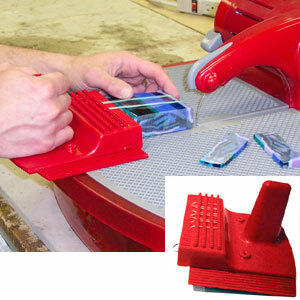 Great to use when cutting thicker materials. 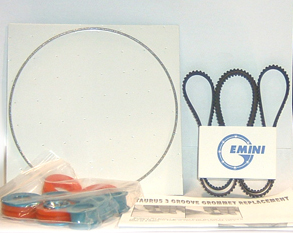 Standard Taurus 3 ring saw blade. Perfect for many different uses. Comes with 2 orange grommets. design with a fine diamond grit that will not chip the delicate dichroic finish! Also works well with iridescent coated glass allowing you to form intricate shapes with perfect edges. 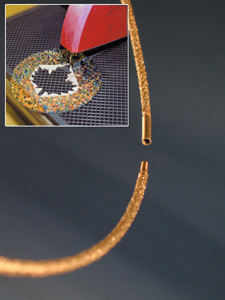 Clean edges mean lower temperatures and faster firing times for kiln fired jewelry creating a clean professional look. These saw are brand new and NOT refurbished. They come directly from Gemini and are factory sealed. Each saw has a serial number that can be verified of this with Gemini. The blade's innovative design uses a narrower profile, making it the most aggressive blade available for the Taurus 3.0 saw. Cut faster than ever, and with the same precision you are accustomed to with quality Gemini products. Blade includes grommets and a special heavy duty flocked belt that offers extra reinforcement for use with the Speed Blade or Slicer Blade. 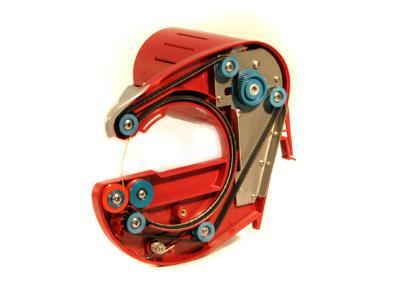 Use this specialized belt to get the best results with your Speed or Slicer blade. Scroll down for blades and accessories. 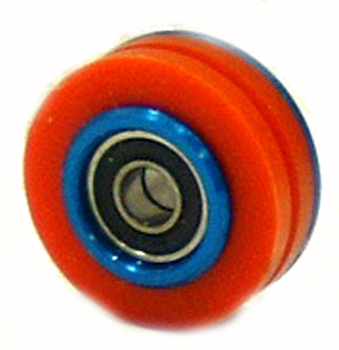 Includes standard blade, 4 blue pulley assemblies, 2 orange grommet assemblies, 2 orange grommets and 1 belt. Free shipping lower 48 states on Taurus 3 saw. Must use Paypal and shipped to confirmed address.